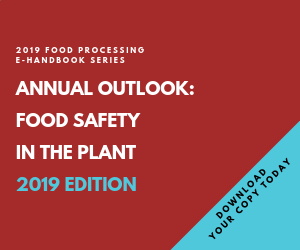 Food safety has become a widely discussed topic in food production facilities, specifically the cleanliness of equipment to minimize food entrapment and potential for contamination. Cleaning processes are more aggressive, requiring equipment manufacturers to provide a reliable solution in harsh washdown conditions. Providing a product to meet these demands requires proper sealing, smooth contours, and a design that eliminates nooks and crevices for potential food debris build up. These products also need to withstand a high temperature spray, at much higher water pressures and increased flow rates used in the cleaning process. The entire line of single and three phase, Baldor-Reliance® food safe stainless steel motors are rated IP69K for water and proven to perform in demanding conditions. IP69K for water rating designation requires products to go undergo aggressive testing. A water intrusion test is conducted as the product spins at 5 rpm while being sprayed at close range, approximately 4-6 inches, with high temperature water, above 176° Fahrenheit and a high pressure, above 1450 PSI, spray. When reliability meets performance in your washdown facility, think Baldor-Reliance food safe stainless steel motors.